Why Do I Need a T.O.C? org-info-js (subsequently called the script) implements part of Emacs Org-mode in its XHTML-exported files, allowing them to be rendered and browsed in a linuxdoc/texinfo style. This documentation is one XHTML file, exported from one *.org file using a single keyboard shortcut. No additional postprocessing was done. There are no external dependencies and the script is small and fast, even for large files. It is used on the org-mode site to display ORGWEBPAGE/Changes.org which consists of more than 220 sections. If you don't mind using it despite the health warnings we wish you good luck and hope the fun will outweigh your effort. Go to the next section by pressing 'n'. Find out about shortcuts in section Shortcuts (and come back here pressing 'b'). In addition, '?' will show all shortcuts available. A list of changes can be found here (separate file). Download the minified version or the source code. Create the minified versions from the sources using the Makefile and a little sed script (see within this directory). Development of the script takes place on github, but every working release is published here on Worg synchronously. That said, you can follow the development by tracking the Worg repo as well, available at https://code.orgmode.org/bzg/worg. This mode displays the sections one by one, paged like the typical linuxdoc or texinfo files. This is the view mode you should face when first visiting this documentation. This mode displays the entire file. In this mode the sections are foldable by clicking the headlines or pressing 'f' (fold). The entire structure of the document may be (un-)folded using 'F'. You may determine what's visible on page load. The table of contents (TOC) is required, albeit it may be hidden (CSS). The TOC may be visited using 'i' (index) regardless of its visibility. A section is everything with a headline. One can click the script-generated links in info view mode to read through the whole file page by page. By clicking on 'toggle view' (or pressing `m´) you can switch between info and plain view mode. The presentation mode is very rudimentary and just a quick hack realy. Press 'x' to see it. When changing the view mode via the 'toggle view' links, the reader gets the same part of the document presented after the view change as he saw before. You may cut the table of contents to a certain depth. The splitting of the document is not affected by this option. Hence you might set the level of headlines to 4, but cut the TOC to show only the first two levels. The script optionally creates subindexes under the headline of a section containing subsections not exceeding org-export-headline-levels. This was done to get a more texinfo/linuxdoc kind of feel and a better orientaton. Choose how to display the document on load. Info-like or plain and more. You may choose to display the 'toggle view' links above every headline or just next the current sections headline. In info view mode every page gets a page number starting from one. Info view mode only. Similar to the \markright command in LaTeX the Title of the current sections parent appears on top of each page. In subsections this heading can be use as link up to start of the parent section (see top of this page when you're in info view mode). You can move to the parent section by pressing `u´ (up). Moving the mouse on the navigation links shows a tooltip with name of next/previous section. The TOC can be hidden completly. Hitting 'i' still will show it. When showing the TOC hitting 'i' any navigation command ('n', 'p', 's'…) will trigger an history-back. Thus the TOC will not get in your way when navigating the history later on. See Section Shortcuts for a list of shortcuts. Navigating a file through the keyboard shortcuts is recorded in an internal history. You may go back and forth in this history. Once an end is reached, org-info.js tries to go back/forth in the browsers history. If you move back to a previous visited file that uses the script, you will return to the place you left the file. Thus following links in published files feels like following footnotes. All features are customizable simply by setting up your export options template (see Setup). Emulates the way of folding in emacs Org-mode. Mouse supported. Search forward, backwards, repeated search… (experimental). Simple regular expressions are supported. Try to search for a[e-h]. *n for example. All searches are case insensitive. Grouping is not supported. We couldn't search for round brackets otherwise. Supported are wildcards (e.g. .*) and ranges (e.g. [a-g]). Sometimes only one match is found between two HTML tags. The longer the expression, the better the matches. As experimental as the text-search, but I love this one. You may link to a file using this script like this: index.html?OCCUR=java. Use regular expressions likewise. 'C' shows a table of contents based on tags. Inherited tags are not supported yet. This was an idea of Rick Moynihan. The exported pages can be linked to the homepage and an directory index or some other sort of parent file. Internal links to section headings are automatically adjusted to work with this script. When following such internal links, one may go back again using 'b'. If the URL is suffixed by '#sec-x.y.z' that section will be displayed after startup. The paging is done according to your setting of org-export-headline-levels. Scanning the TOC is a good way to get around browser detection. An option to hide the TOC exists. Show a little message on page load to tell the visitor about the script usage. The OrgHtmlManager object provides hooks (two currently) to add custom actions. The visitor of this file (and every XHTML-exported org file that includes the script) may use the mouse or the following keys to navigate. '?' should give you a list of shortcuts. The script always tries to keep the last selected section visible. This is somewhat strange when scrolling, but really helpful for keyboard navigation. The TOC is handled specially, when hidden. If you press 'i', the TOC is displayed. Any subsequent key press goes back to where you've been before. The TOC does not show up the history. Same applies to the keyboard help. b / B go back to last / forward to next visited section. s / r search forward / backward…. Thanks Carsten, for this beautiful table! This section describes how to setup your org files to use the script. Export-Setup - the new Way covers setting up org XHTML export with Org-mode version >= 6.02. For those using an older Org-mode version < 6.02 the next section (Export-Setup - the old Way) remains. Using Set() contains a list of all supported options for adjusting the org\_html\_manager to suit your needs. See the Download section on how to obtain a version of the script. The first version of this document was created with the new XHTML exporter which was revised by Carsten Dominik in March 2008 (in Org-mode v5.23a+) to better support XML. You can use M-x org-version to see which version of Org-mode you have installed. The modern way of org export setup provides extra options to include and configure the script, as well as an emacs customize interface for this very purpose. Options set in customize may be overwritten on a per-file basis using one or more special #+INFOJS_OPT: lines in the head of your org file. scroll to the bottom and click Org Export HTML INFOJS. On this page three main options may be configured. Org Export Html Use Infojs is very good documented and Org Infojs Template should be perfect by default. So I'll concentrate on Org Infojs Options here. Absolute or relative URL to the script as used in in XHTML links. 'org-info.js' will find the file in the current directory. Keep in mind that this will be the directory of the exported file, eventually a directory on a server. showall — plain view mode showing the entire document. Show the table of contents? Publishing/Export property — derivate this setting from another property like org-export-with-toc. Should the script insert a local table of contents below the headings of sections containing subsections? The default is no. nil — hide the toc (only show when 'i' is pressed). This is the default, if this option is omitted. above — sho the toc directly under the sections heading. Highlight the headline under the mouse in plain view mode? #dddddd — or any valid XHTML/CSS color value like red to draw a colored background for the headline under the mouse. Obsolete. Number of attempts to scan the document. It's no risk to set this to a higher value than the default. The org_html_manager will stop as soon as the entire document is scanned. Affects plain view mode only. If 't', display the little Up|HOME|HELP|Toggle view links next to each headline in plain view mode. An URL to link to the homepage. The text displayed is HOME. An URL pointing to some main page. The text displayed is Up. This section describes the old way to setup the script using the org-export-html-style configuration. If you own a current version (6.00 ++) of Org-mode you should better use Export-Setup - the new Way of setting up the export for script usage. You might want to read the sections The XHTML for more information. Using Set() contains a list of all supported options recognised by the script. Ensure to precede all the verbatim double quotes with a backslash and include the whole value of org-export-html-style into double quotes itself. One could customize the option 'org-export-html-style' globaly by :M-x cuomize-variable RET org-export-html-style RET and set it there. This way all your files will be exported using the script in the future. If you publish entire directories, supply an absolute URI to the src attribute of the first script tag above. One may overwrite the author's settings using special suffixes appended to the URL of the script. Here are some examples linking to this section and changing the intial view mode. Currently only the 'internal' options are used (see Using set() for a list). Note that it is not possible to change the 'HOME' and 'Up' links. Note also that everything but [0-9a-zA-Z\.-_] should be URL encoded if used as an options value. Here is an excerpt from the stylesheet for this file. Be carful not to mess things up when trying to position the console. The functionality of the script is based on DOM. This leads to some incompatibility with legacy browsers. But hey, it's 2009, isn't it? Opera 7.0 and higher - v.9.26 tested. I try to test the script before each release in Firefox 3.x.x and Opera 10 on Linux, and in FF 3, IE 6 and Safari on windows. Because of the number of features and browsers, some bugs might remain undiscovered. Please report bugs to the emacs-orgmode mailing list. In most cases we manage to fix them within the next 24 hours. So let's gather the tested Browsers here. Problems are only listed, if they are Browser specific. Let me say it again: we don't wont to support legacy browsers, do we? If you manage to get this thingy working in any browser please let us know, so we can update the above table. Currently the script depends on the table of contents in the resulting XHTML. The TOC can be hidden though. The main reason is the behaviour of browsers. There is no safe way to detect if the entire document is loaded at a certain point in time. Opera for example returns true if we ask it if(document.body). The init() function of the OrgHtmlManager is aware of the possibility, that not even the TOC might be loaded when this function is called. Hence it should work for slow connections too. which is valid XHTML but not understood by all browsers. I'll use the first version throughout this document where ever the space allows to do so. Set to a true value to start in textinfo kind of view. Note: you could also use org\_html\_manager.INFO\_VIEW, org\_html\_manager.PRESENTATION\_VIEW or org\_html\_manager.PLAIN\_VIEW. Defaults to plain view mode. If 1, hide the table of contents. If set to a true (1 or not empty string) value, create subindexes for sections containing subsections. See sections 1 2, or 3.1 of this document. The index below the headline (under 'Contents:') is generated by the script. This one is off by default. If true, include the small 'toggle view' link above every headline in plain view too. The visitor can toggle the view every where in the file then. If false, only at the top of the file such a link is displayed when in plain view. Default is false. Highlight the heading under the mouse. This can be a background color (like '#ff0000', 'red' or 'rgb(230,230,230)') or the keyword 'underline'. This way we can link files into a tree, if all subdirectories in the project follow the same conventions. The 'h' shortcut will bring you there as well. The 'H' shortcut will trigger this action. Cut the TOC at a certain level. This was done to support big big files and was requested by Carsten Dominik. If '0' or not provided at all the TOC will not be cut. If set to a number greater than '0', the TOC will cut to only show headlines down to that very level. Display a little message on page load? Defaults to no message. Set to 1 to display the startup message. Currently two hooks are provided. Each hook function is called with one or more parameters the first of which is the OrgHtmlManager object. This hook is run once the document is loaded, the view is setup and the startup section is shown. The second parameter is the first section shown, i.e. an OrgNode object. This one runs after showing a new section. This hook is not called for the first section shown. Use the 'onReady' hook for the first section. The second parameter is an object with to OrgNodes: the previously shown section and the current section. To add functions to the hooks, fill a global object orgInfoHooks with the function objects you need. This is necessary, because code added via the #+STYLE: option lines is executed before org-info.js is loaded. Make sure to remove hook functions at the end of the hook. Strange things could happen otherwise (the hook loop will overlook a member. While the hook loop runs in first hook first, the remove loop removes the last hook first). First of all the script is included in the header as described in Setup. The document has to be exported with TOC since the script depends on it (See Why Do I Need a T.O.C?). The org\_html\_manager::setup() function, that you will have to call yourself (see examples in Setup), sets up a timeout function calling its init() function after 50ms. After those 50 ms The init() function starts its first attempt to scan the document, using the TOC as a guide. During this scan the org\_html\_manager builds a tree of nodes, each caching some data for later use. Once an element of the document is scanned it is marked by setting a property scanned\_for\_org to 1. This way it will not be scanned a second time in subsquent runs (it will be checked though, but no work will be done for it). If the document (or the TOC) is not entirely loaded, org\_html\_manager stops scanning, sets the timeout again to start an other scan 50 ms later. Once the entire document is loaded and scanned no new timeout will be set, and the document is displayed in the desired way (hopefully). Once the number of attempts to scan the the document was configurable. This was dropped, since we can not know in advance how fast the document will be loaded on the client side. 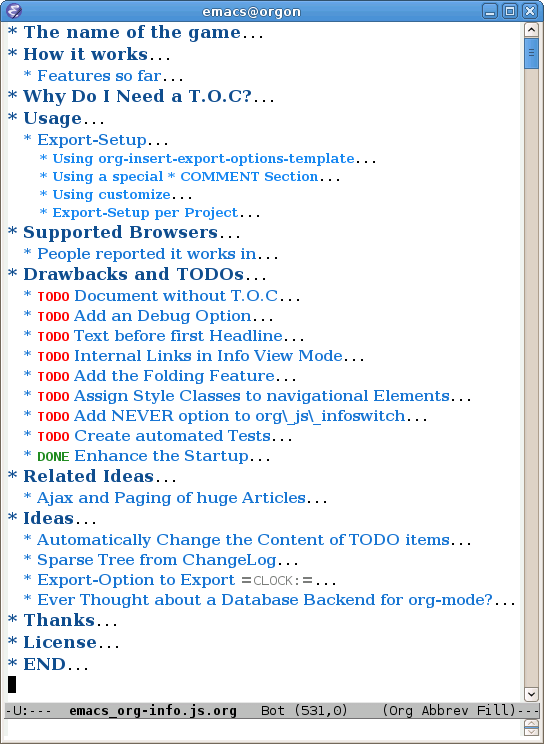 The org\_html\_manager also changes the document a bit to make it react on certain input events and follow your wishes. The old 'event handling' was entirely based on the normal link functions using so called accesskeys. This has changed long ago, but the accesskeys will stay cause there is no reason to remove them. The script can handle all the sections as single slides. Press 'x' to switch to the presentation mode. In this mode you may navigate the sections using the mouse. Currently a single click moves forward and a doubleclick backwards (will change this to right mouse button for backwards movement). The first plain list (i.e. an <ul> element) in a section is special. The items will be shown one by one when moving forward. If you're at the end of the presentation, a click does not trigger a warning. Same applies to a doubleclick when in the first section. There is no plan to extend this feature set very much. A better plan might be to write a separate tool to handle slides. The aim of this little script was to implement a part of emacs Org-mode facilities of folding. Oh, no - not originaly. My first idea was to view some of my larger org files without scrolling. I wanted to have them paged just like texinfo or linuxdoc files. In February 2008 I came across Carsten Dominik's ideas page https://orgmode.org/todo.html. And I could not resist to write him some of my thoughts about this great emacs mode including some little ideas and drawbacks. I don't know how, but somehow these guys made me, lazy bone that I am, write this little script as an appetizer of web 3.0 in Org-mode (Phil Jackson). I did and since some people really liked it, worked a bit more on it and added features. Bastien Guerry was so kind to publish it on http://www.legito.net/org-info-js/ the first months. Thanks Bastien. In the first days of April Carsten Dominik added code to Org-mode to support the usage of this script. Hence the script may now be configured in a similar way to the other export options. Since then it is even possible to configure this script through customize. Very special thanks to Carsten Dominik, Bastien Guerry and Phil Jackson who have encouraged me to write and publish this little piece of (unfinished) work and all the hundreds of hours they spent on this fantastic emacs mode called Org-mode and the export modules. Org is a new working experience for me and there is nothing comparable to working with emacs AND Org-mode. Another big kiss to Gabi (www.emma-stil.de) for being so patient while I was not working on our projects but playing with emacs. And again big thanks to Carsten Dominik for making the inclusion and configuration of the script so easy for the users, all the inspired ideas and the great org radio table trick. A lot of the power of the final make up is your merit! We all love to read the Org-mode mailing lists because of the kind and relaxed tone that is yours. Thanks a lot for OrgMode! What I think about licenses? Well - I think licences and patents are not far from each other. Poor people (and poor countries!!!) stay poor because of both of them. But since I know where I live, in a world made of licenses and patents, I have to apply some license to my work to protect it and stay unprotected. Hence the script was originally licensed under GPL 2. Since v.0.1.1.6 the license was changed to GPL version 3. This document is subject to GFDL. The original version of this document was written in emacs23 with Org-mode v. 5.22a+. The visibilty of the contents of a individual section or subsection can be toggled by clicking the stars in front of the headlines or moving there and hitting TAB. The visibility of the entire document structure can be changed by pressing SHIFT+TAB anywhere. When on a headline, pressing ALT+UP/DOWN moves the entire subtree to different location in the tree, keeping its level of indentation. ALT+LEFT/RIGHT promotes and demotes the subtree.